Groundwork Denver is filled to the brim with staff who are just as passionate as they are committed to fulfilling the mission of the nonprofit organization. Take Sandra “Sandy” Douglas for example, who has served as the ParkRx Program Manager for GWD since the summer of 2016. ParkRx, also referred to as Park prescription, is a growing national movement that advances the use of parks and public lands to improve health and wellness. The pilot project took flight in 2016 and since then, has continued to increase residents’ awareness of park amenities, encourage healthy physical activity, improve the health and well-being of residents, and increase safety and positive use of the park. To Sandy, the ParkRx program can be summed up as an eventual doctor’s prescription. “Just imagine a doctor one day writing a prescription for high blood pressure, but instead of giving you a medication, he will give a script saying, ‘go to Mestizo-Curtis Park,’” Sandy said. “That’s the ultimate goal. That’s where we would like to get,” she continued. 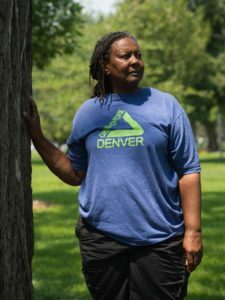 The “ultimate goal” of using the park as a form of healing isn’t just the task Sandy is working tirelessly to accomplish, it’s also the focal point to her most recent healing experience. “It caught me at a time where shortly after I began organizing [ParkRx], I became very ill. The best thing for me, at the time, was the park. It’s just such a wonderful thing that happened to me. I was able to spend lots of my sick days in the park, in the fresh air. My exercises were limited, but I was able to walk, and I was able to do that through the illness. It’s special to me,” Sandy said. ParkRx offers several outdoor activities and exercise classes ranging from AquaZumba to Run and Walk Boot Camp and yoga to name a few. 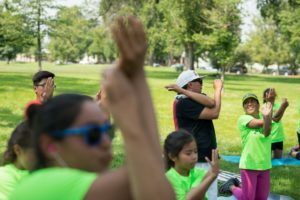 As Denver’s oldest park, some would say Mestizo-Curtis Park has a reputation of being unsafe to the residents of the Five Points neighborhood and surrounding communities. In an evaluation of the ParkRx program conducted by Point B(e) Strategies in December 2017, 39% of respondents thought Mestizo-Curtis Park was very or somewhat unsafe before participation in the ParkRx program compared to only 7% after ParkRx participation. In addition, ParkRx has had a significant impact on the well-being of those in the community. In the same evaluation, focus group participants were asked how the ParkRx program affected their health. Many stated they have lost weight and have lowered their blood pressure. Several interview respondents indicated they not only found physical benefits, but also mental and emotional benefits from connecting to community and engaging with, and being encouraged by, their neighbors. “It allows us to work together, side-by-side. If you see any of the pictures or videos, you would see we are having fun. It’s different from going on a 5K and you’re trying to make it there and all you’re thinking about is the finish line. We appreciate the journey,” said Sandy. “It’s togetherness, it’s allowing us to see and hear each other’s problem’s and share each other’s pain,” she continued. When asked what her favorite part about working with ParkRx was, Sandy was hesitant to answer. “I love it all but the main thing I love is the people and working with them. When I work with Groundwork Denver’s ParkRx, I get so into it. I immerse myself. I have to remember I have a family sometimes,” she laughed. To learn more about the ParkRx program, click here or email Sandy@GroundworkColorado.org.